We, Indian Tent, are the leading names engaged in manufacturing, producing and supplying of wide variety of tents with royal seating. We are providing luxury tent, mughal tent, wedding tent, raj tent, royal tent, handmade tent, party tent, pergola tent at your budget cost. Imperial Raj Tent:- We offer Imperial Raj Tent at cost-effective price with versatile patterns. Its design is super along with curtains is beautifully folded with the support of ropes and poles. Pitching process is very fast and quick. 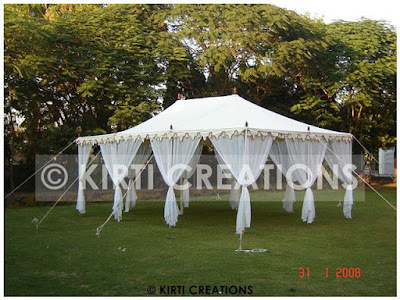 We supply Indian Tent for rent in impressive style. Indian Tent is highly attracted due to attractive designs, sturdy construction, robust, easy installation and much more. Indian tent choose advance technology as well as outstanding decoration. We offered quality and impressive Handmade Tents to the various requirements of our customers.